For the topping: In a small bowl, mix the flour, rolled oats, browns sugar, cinnamon, and butter together until crumbly. Set aside. For the cookies: In a mixing bowl, combine together the cake mix, cinnamon, and nutmeg. Add the butter, eggs, and vanilla and beat until smooth. Refrigerate for 20 minutes to allow the dough to set up. There are two ways to make these cookies – the first I will show you makes flat cookies that are a little messy looking but moist and chewy and the second uses a cupcake pan to form thick, cleaner looking cookies. Assemble them however your heart desires! On a cookie sheet lined with foil or parchment paper (I recommend parchment paper), drop spoonfuls of cookie dough (give them space to spread out), flatten the top of your drops with the back of a spoon. On top of the dough, place a spoonful of Lucky Leaf Blackberry Pie filling. Sprinkle some of the crumble topping over the filling, pressing down so the topping sticks. 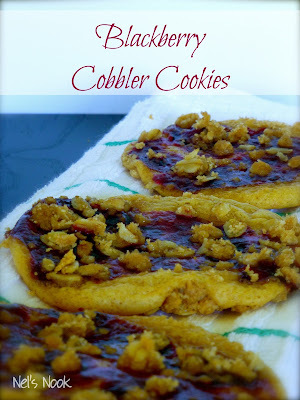 You will want to cover the entire top of the cookie with the crumble topping. Bake for 10-12 minutes or until the cookies are golden brown. Let the cookies cool before removing from the cookie sheet. 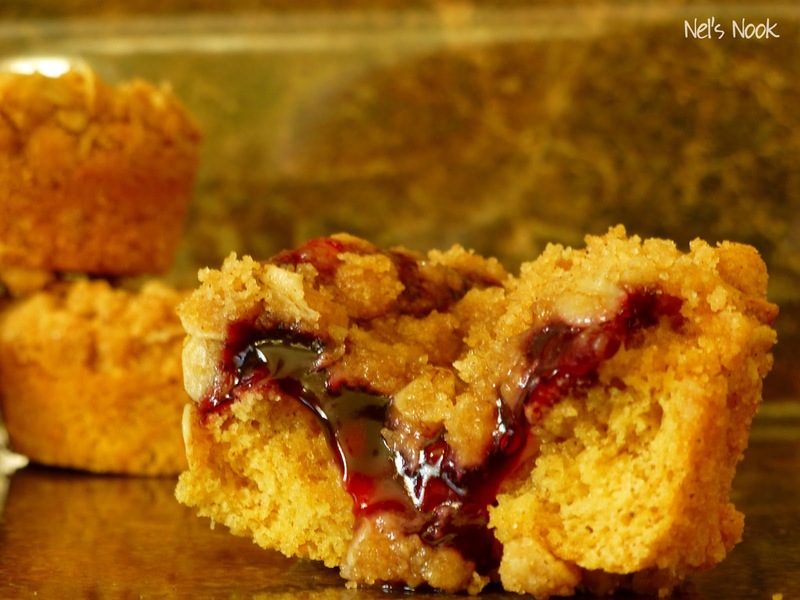 Add a spoonful of cookie dough to greased cupcake tin wells. Spread the cookie dough so that it overs the bottom of each well. Add a spoonful of pie filling over the cookie dough. Sprinkle some of the crumble topping over the filing, pressing down so that the topping sticks. Bake for 12-15 minutes or until the cookies are golden brown. Let the cookies cool before removing the cookies from the cupcake tins. Run a knife around the edges of the cookies to help them come out. These cookies are good warm or cold and delicious with a cup of coffee! Store them in an air tight container. So now it's your turn - what meal or dessert reminds you of your mom (or dad)?? Do you make them on your own or wait until you go over there to get the real stuff? **Update This recipe has been entered into the Safest Choice Eggs recipe contest hosted on Bakeaholic Mama and Buns In My Oven. nice post i like this post thanks for sharing this post.